The Manchester Evening News has launched its first Sunday edition, a digest of the week’s news and features with some new content and a new lifestlye and leisure supplement included. The Sunday edition of the Reach-owned regional title has the same 85p cover price as the weekday copies, but carries more editorial content. The newly launched edition will focus on giving more space to long reads that have already appeared online or in print, but also has a budget for new content, according to MEN editor-in-chief Darren Thwaites. However, there are no new editorial hires and Thwaites has extended his responsibilities as editor to cover the additional print day. 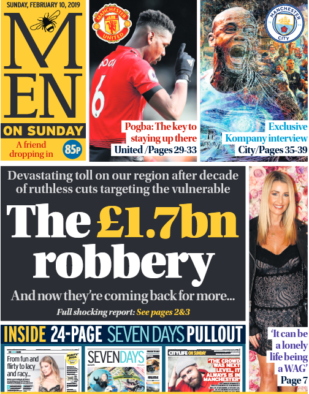 MEN on Sunday is home to a new pull-out supplement called Seven Days that includes leisure and lifestyle content as well as seven-day TV listings. The paper’s politics and investigations editor Jennifer Williams also has a new column in the Sunday edition, titled “Williams on Sunday”. “We’ve got the facility to buy in additional content just for print, if we wish,” Thwaites told Press Gazette. Asked why MEN had decided to launch a Sunday paper now, Thwaites said: “What made it a compelling proposition is we’re finding some of our longer reads, more investigative and analytical content, is working very well on Sunday afternoons and evenings. Thwaites later noted that Sunday is a “very influential day politically”, adding: “Clearly the reality is that most political journalists are in Westminster. He said that the Sunday edition would still consider itself a regional title but pointed out that the size and importance of Manchester would lead to it being picked up by the national media – including the Andrew Marr Show, which featured the MEN on Sunday in its paper review last week. The launch of the new Sunday paper comes as the circulation of the weekday MEN continues to fall – with the latest regional ABC figures showing its print circulation declined by 13 per cent year-on-year in the first six months of 2018. Asked what challenges the MEN faced in the market, Thwaites said: “We face, like any other title, the continued transition of our industry. There’s less demand for print that there was and there’s accelerated demand for digital. Speaking about the commercial thinking behind the launch of a new print product, he said: “While you might say if you really look hard you could find this content online… the reality is that this enables us to package everything together in one place and our research shows that people talk about the experience of reading a newspaper now. “They talk a lot about spreading it out on the kitchen table and they talk about the ‘me time’ with a newspaper. It’s really important that we remember the enjoyable experience that a newspaper provides. The first edition of MEN on Sunday had a print run of around 50,000 copies – but circulation figures for the title are not yet available. Asked if MEN had made fresh hires to staff its Sunday paper, Thwaites said it had “adjusted our production numbers to make sure we’ve got the right number of people to design and output the product” but had not hired new reporters for the title. The MEN marked its 150th anniversary late last year. The post Manchester Evening News launches first Sunday edition with new supplement but no new reporters appeared first on Press Gazette.